This image is a newspaper reproduction of a cabinet card originally made by George Downing and copied by F. G. Willard. 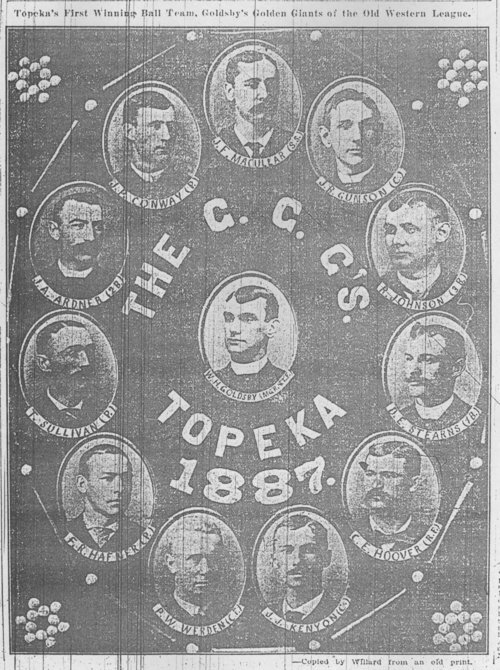 It features players on Topeka's second minor league team, the 1887 Goldsby's Golden Giants. A member of the Western League, the Giants team not only was the most successful in Topeka's history, it was among the nation's best minor league teams in the Nineteenth Century. The Golden Giants had a league record of 83-24, for a .776 winning percentage. (Some sources report the team's record as 90-25. The difference may be due to the fact that the final standings excluded games involving two latecomers to the league, Wichita and Emporia.) In the center of the photo is Walt Goldsby, the team's player-manager. Starting at the top and moving clockwise, others pictured are: Jimmy Macullar (ss); Joe Gunson (c); Ralph Johnson (3b); Dan "Ecky" Stearns (1b); Charlie Hoover (rf); Jake Kenyon (c); Perry Werden (cf); Frank Hafner (p); Tom Sullivan (p); Joe Ardner (2b); and, Jim Conway (p). The cabinet card was produced early in the season, and does not include some of the team's players, notably Bug Holliday, Jack Sneed and Harry Dooms. This reproduction appeared in the April 19, 1912 edition of the Topeka State Journal.